Declared the Eighth Wonder of the World and a UNESCO Biosphere Reserve, the Paine Massif is known as one of the most beautiful mountains on the planet. Formed around 12 million years ago, this geologic work of art is a magnet for trekking and climbing aficionados, making it the third most-visited park in Chile. The trekking circuits––known as the O and the W––are on the short list of must-visit treks from around the world. These hikes offer visitors turquoise lakes, pristine glaciers, gorgeous forests, and striking pampas, and are home to species including the Puma, Huemul (South Andean Deer), Ñandú, and Guanaco. Watch the sunrise or sunset at Laguna Amarga or Laguna Azul, where on windless days, you can see the Torres reflected in the water. Visit one of the Paine waterfalls, such as the Salto Grande or the Paine Falls. Kayak, row, or travel by boat through gorgeous icebergs to the Grey Glacier, where on clear days, you can get a spectacular view of the Olguín Range. Visit Lake Sarmiento. Along its shore, you can find strange, primitive calcium carbonate formations––very similar to coral––called thrombolytes, which are linked to the first expressions of life on our planet. Hike one of the park’s trekking routes. The most well-known, emblematic routes include the Valle del Francés (French Valley), Base de las Torres (Towers Base), and Grey Glacier. These can be done as day treks, or as part of the W route, which features 47 miles of gorgeous hiking over 5 days. For lovers of trekking looking for a challenge, the Paine route––also known as the O––includes 58 miles of incredible hiking over eight days, circling the Paine massif completely. The park features 14 ecosystems and 270 different plant species. Towards the west, the influence of the Chilean Icefields can be felt in the higher levels of precipitation, which taper off as you move east. The main types of vegetation found in the park include pre-Andean shrubland, Magellanic forest, Patagonian steppe, and Andean desert. During springtime, Notros, Neneos, and Matas Grises flower. Other beautiful species, such as the Capachito and the Zapatito de la Virgen, can also be found in the park, along with several species of Orchids. The berries of the Calafate (Magellan Barberry) and Chaura plants also delight visitors with their colors, as do the Lengas and Ñirres, which turn red during fall. The Puma is one of the park’s central figures. They are more likely to be found in the eastern section and around Lake Sarmiento. The Puma’s main prey is the Guanaco, which are often seen near the Amarga, Azul, and Sarmiento lagoons. Other animals frequently spotted in the park include the Zorro Culpeo (Andean Fox), Chillas (South American Gray Fox), Chingues (Molina’s Hog-Nosed Skunk), and Armadillos, along with Huemules (South Andean Deer), the latter of which can sometimes be found in the western section of the park. The park is also home to more than 100 types of birds, including the Condor, the Águila Mora (Black-Chested Buzzard-Eagle), the Flamingo, the Magellanic Woodpecker, the Cometocino, the Diuca, and the Chincol (Rufous-Collared Sparrow). For those interested in prehistoric animals, in January 2017, near the Tyndall Glacier, fossils of the marine Ichthyosaurs that inhabited the area more than 70 million years ago were found. The Aonikenks, or Tehuelche people, were nomads who traveled the Patagonia by foot. They were expert hunters and used spears and bow and arrow to hunt Guanacos and Ostriches. With the introduction of horses to the region during the 18th century, these peoples extended their routes through the southern steppe and made new hunting tools, such as boleadoras, a throwing weapon made of weights attached to cords. They were among the first peoples to have contact with Europeans traveling to the region, and their history has since been steeped in legend. In 1520, Hernando de Magallanes arrived at San Julián Bay, and Antonio Pigafetta, the expedition’s chronicler, started the myth about the giants who inhabited the edge of the world. The name “Patagón” was etched in the mind of navigators for centuries, and though the legends stretched the truth, the Patagones––today known by their original names of Aonikenks or Tehuelches––were indeed tall and strong men, with their average height reaching six feet. From Punta Arenas, drive 155 miles north on Route 9, which is paved. Once you reach Puerto Natales, continue along the same route toward Villa Cerro Castillo, which will bring you to the Sarmiento and Laguna Amarga park entrances, 70 miles and 80 miles from Puerto Natales, respectively. Another option is to take Route Y-290 from Puerto Natales, which passes the Milodón Cave and arrives at the Serrano park entrance roughly 50 miles from Puerto Natales. It’s also possible to reach the park from Argentina. Cross the border at the Río Don Guillermo Pass, located at Villa Cerro Castillo, 217 miles from Calafate. From Cerro Castillo, it’s 32 miles to the Sarmiento park entrance. Various bus routes connect Punta Arenas and Puerto Natales. Companies include Buses Fernández, Buses Pacheco, and Bus Sur. There are also bus routes that travel daily from Puerto Natales to Torres del Paine, stopping at the Laguna Amarga park entrance. Companies include Bus Sur, JB, María Jose, and Juan Ojeda. 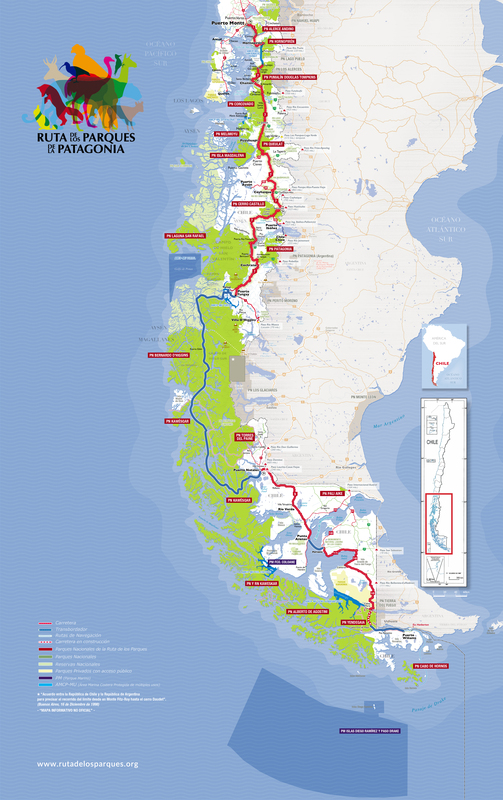 There are also various companies offering daily bus trips from Calafate to Puerto Natales. Ferries departing from Puerto Yungay sail to Puerto Natales through the Patagonian Channels, in a voyage of approximately 41 hours. From Puerto Natales, take Route 9 or Y-290 to Torres del Paine. Cruises also depart from Puerto Montt, reaching Puerto Natales in a trip of 4 days. From Puerto Natales, you can take a day trip to visit Bernardo O’Higgins National Park, where you’ll visit the Balmaceda and Serrano Glaciers and can travel up the Serrano River until you reach the Serrano village, located near the port of the same name. Various airlines offer daily flights to Punta Arenas, and during high season, LATAM Airlines also offers direct flights to Puerto Natales. DAP Airlines offers twice-weekly flights connecting Balmaceda and Punta Arenas. Direct flights from Santiago take around 3.5 hours. This trail crosses the hanging bridge over the Pingo River, then reaches the Grey beach, where you can often see ice falling from the Grey Glacier. A steep trail that ascends to one of the best lookout points in the park, from which you can see part of the Southern Icefields, Lake Gray, and Lake Pehoé. The trail travels alongside the Pingo River, through a beautiful forest from which you can get a glimpse of the Paine massif. It ends at a gorgeous waterfall. The trail starts at the Pehoé campsite and ascends to a plateau offering panoramic views of Lake Pehoé and the Paine massif. A relatively easy walk that leads to the Salto Grande (Large Waterfall) and winds along the shores of Lake Nordenskjöld, ending at a lookout point with front-side views of the Paine massif. After crossing Lake Pehoé, this trail runs along the shores of Lake Skottsberg, reaching the Valle Francés (French Valley). If you’d like, you can continue your hike to the Mirador Británico (British Lookout Point, 2.5 hours/3.4 miles each way), which offers 360-degree views of spectacular granite formations, including La Hoja, La Espada, La Máscara, Fortaleza, and Aleta de Tiburón. Once you’ve crossed Lago Pehoé, hike toward Grey Glacier to enjoy spectacular views of the glacial walls and the icebergs that float in the lake that shares its name. If you’d like, instead of walking back, you can hire a boat to take you across Grey Lake to the Grey ranger’s office. This is an ideal hike for spotting wildlife and getting a look at the 4,000-year-old cave paintings. The trail leads up the Ascencio Valley, through a forest, and along a glacial moraine for around one hour before arriving at the base of the Torres. This trail begins at one edge of Laguna Verde and leads you through a beautiful Lenga forest, ending in the western sector of the park, where you’ll find spectacular views of Lake Toro. Las Torres–Serón: A low-difficulty hike through forests of Lenga, Coigüe, and Ñirre. Make reservations for the Serón campsite at: www.fantasticosur.com. Serón–Dickson: A hike to Lake Paine, with views of Lake Dickson and the Dickson Glacier. Make reservations for the Dickson campsite at: www.verticepatagonia.cl. Dickson–Los Perros: Ascends through the forest to a beautiful view of Lake Dickson. The day’s hike ends in front of the Los Perros Glacier. Make reservations for the Los Perros campsite at: www.verticepatagonia.cl. Los Perros–Grey: The most difficult day of the circuit. Follow a glacial moraine up to the John Gardner pass (4,071 feet above sea level), then descend steeply through the forest. The pass can close if weather is inclement. Make reservations for the Grey cabins and campsite at: www.verticepatagonia.cl. Camping is also available at the Paso campsite, which is managed by Conaf. Grey–Paine Grande: A hike with beautiful views of the Grey Glacier, as well as excellent vistas of Lake Pehoé and the Paine Grande. Make reservations for the Paine Grande campsite at: www.verticepatagonia.cl. Paine Grande–Los Cuernos: The trail runs along the shores of Lake Skottsberg before reaching the Valle Francés (French Valley). If you’d like, you can continue the hike to the Mirador Británico (British Lookout Point, 2.5 hours/3.4 miles each way), which offers 360-degree views of spectacular granite formations, including La Hoja, La Espada, La Máscara, Fortaleza, and Aleta de Tiburón. Make reservations for the Los Cuernos cabins and campsite at: www.fantasticosur.com. Camping is also available at the Italiano campsite, which is managed by Conaf. Los Cuernos–El Chileno: This hike runs along the shores of the beautiful Lake Nordenskjöld, in a day with little altitude loss or gain. Make reservations for the Chileno cabins and campsite at: www.fantasticosur.com. El Chileno–Base Las Torres–Campsite/Cabins Las Torres: If you rise early, you can arrive at the base of Las Torres to watch the sun come up and take in the red and orange colors of the granite massif at dawn. The trail ascends through the Ascencio Valley, with beautiful views of Almirante Nieto from the Chileno campsite. If you rise early, you can arrive at the base of Las Torres to watch the sun come up and take in the red and orange colors of the granite massif at dawn. After that, hike to Los Cuernos along the shores of Lake Nordenskjöld. Make reservations for the Los Cuernos cabins and campsite at: www.fantasticosur.com. The trail takes you to the Valle Francés (French Valley), where you have the option of continuing your hike to the Mirador Británico (British Lookout Point, 2.5 hours/3.4 miles each way), which offers 360-degree views of spectacular granite formations, including La Hoja, La Espada, La Máscara, Fortaleza, and Aleta de Tiburón. You’ll finish the day at the shores of Lake Pehoé. A walk with beautiful views of the Grey Glacier and Sierra Olguín. Make reservations for the Grey cabins and campsite at: www.verticepatagonia.cl. You can depart via boat to the glacial wall and return to Grey Beach and the Grey ranger’s office. Another option is to return to Paine Grande and take the boat across Lake Pehoé. Reservations are not necessary for park entry, but you do need to reserve campsites and mountain cabins along the trekking circuits in advance. These can be reserved six months before your trip, at most; the system does not allow for reservations more than 180 days in advance. If you cannot find any available campsites in the areas you wish to visit, we suggest adjusting your itinerary based on availability. You cannot camp or stay in a cabin without making a reservation in advance. There are no ATMs in Torres del Paine. We recommend withdrawing at the ATMs in Puerto Natales. January and February can be busy in the park, so if you prefer to hike with fewer people on the trails, we suggest visiting during other months. Strong winds are very common in the summer and can reach up to 75 miles per hour. Bring clothing appropriate for experiencing all four seasons in one day. The main port of entry to Torres del Paine, Puerto Natales lies 153 miles north of Punta Arenas, between the Almirante Montt Gulf and the Última Esperanza Sound. Located 60 miles from Punta Arenas, this is the only town in Río Verde and the main port of entry to Isla Riesco. Its population density is 0.1 people per square mile, and 250 people live there year-round. Punta Arenas is the largest city in the Magallanes region and the main port for maritime travel north and south along the Chilean coast and to the Argentine port of Ushuaia.